Keep the drawers of your filing cabinet in perfect order with this Bisley Plastic Insert Tray. Split into 16 compartments, you can organise and store stationery items, notes, coins and more, to encourage efficiency in your home or office. 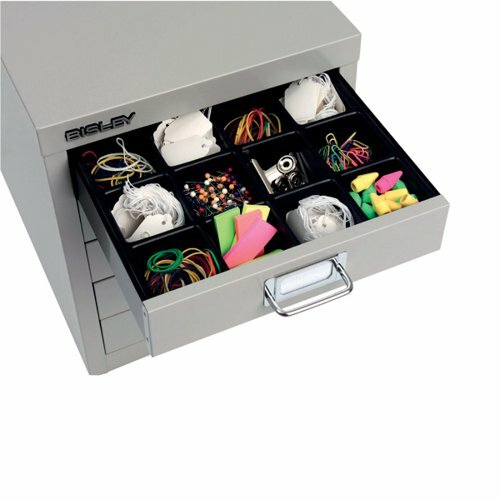 Compatible with Bisley A4 Multi-Drawer Cabinets, this 51mm high tray offers an easy solution to streamline your office processes. Please note: this pack only contains 1 tray. Black plastic insert tray suitable for multi-drawer cabinets with drawer heights of 51mm and 83mm only.